Subscribing to my theory that barrel aging makes everything better, Sierra Nevada took its already great Bigfoot Barleywine and aged it in Jim Beam, Jack Daniels, and Heaven Hill barrels. Just drinking those liquors on their own sounds pretty good right now. The beer I'm drinking tastes good but I'm not getting drunk enough. Typing isn't even a challenge yet. 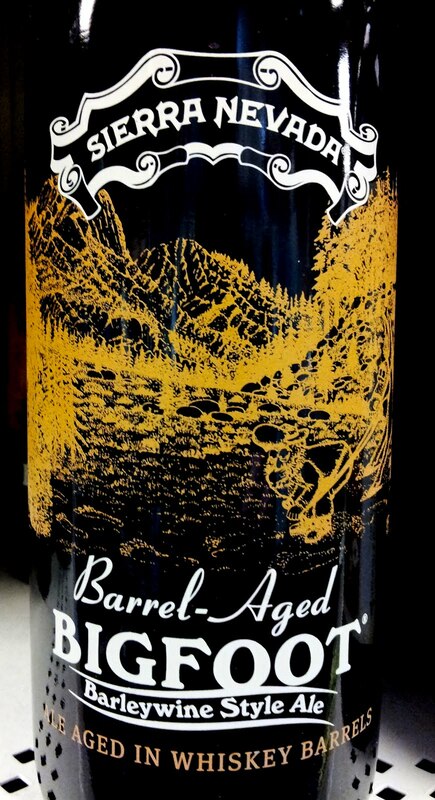 Sierra Nevada had the patience to age Bigfoot in those barrels for almost two years before unleashing it to you in honor of Bigfoot's 30th anniversary. The normally hop-forward beer makes an expected moves towards a sweeter beer, as well as packing a stronger punch. Barrel aging brings the ABV from 9.6% all the way up to 11.8%, so you might want to share this with a friend. Or drink the whole bottle and do some Jack shots and pass out and wet the bed; you're your own boss now. Barrel Aged Bigfoot is packaged in 25.4 oz. corked and caged bottles. I saw this at Kelly's on Wyoming for $13.99 though prices may vary around town. I'm still trying to get past the wetting the bed part... but after that I'm going to look this beauty up.